June 20th, 2017, World Refugee Day. The Project Reconnect team has been visiting with grantees all over Germany to learn how they are using the Chromebooks to help refugees. The "Arbeitskreis Uni für Alle" has received Chromebooks from the Immental-Stiftung. At the university, refugees have the opportunity to prepare for their studies supported by an experienced student. Refugee students can borrow a Chromebook and receive access to an online German language course. Lisa Stein, Project Reconnect, called at the university in Freiburg. The "Bazärle" in Weissach im Tal near Stuttgart received Project Reconnect Chromebooks through Kreisjugendring Rems-Murr. In the little, cramped store, refugees can buy clothes or food - and borrow laptops to learn German, find housing or to research and fill out required forms from German authorities. The Chromebooks from the “Bazärle” are in high demand. Other locations of the Kreisjugendring offer tutoring and childcare. Theresa Ritzer, Project Reconnect, visited Weissach im Tal. 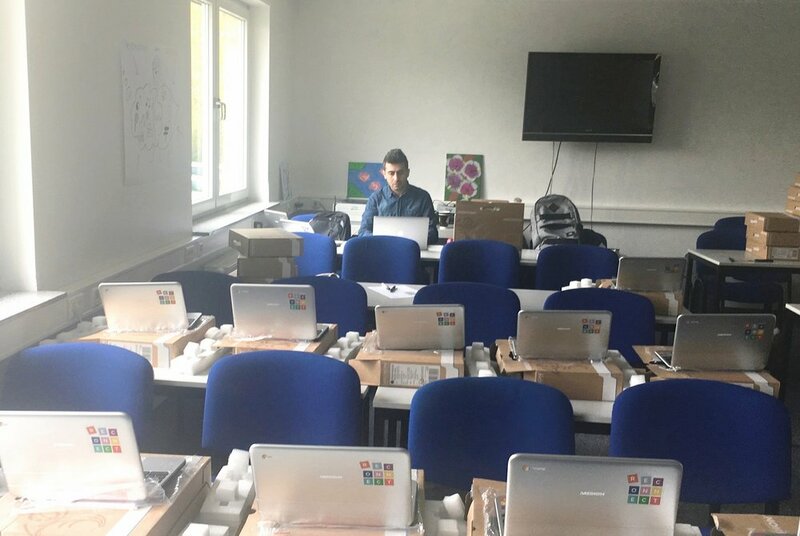 In Bochum in Northrhine-Westfalia, employees of the Arbeiterwohlfahrt Ruhr-Mitte - Bobeq are preparing Chromebooks for integration courses in Bochum and the region. In combination with online content, the laptops will be a huge help for refugees. Omar Azad Ahmad, Project Reconnect, supported the employees in the preparation of the Chromebooks and trained them on how to configure the laptops. Several times a week, the internet cafe in the refugee home in Berlin Wilmersdorf opens its doors. The residents are looking for news from their homeland or learning German. “The children are very enthusiastic when they discover a new 'cool' game online,“ says Sita Baer from Arbeiter-Samariter-Bund. If the game is also educational, the supervisors are particularly pleased. Ahmed Al-Tameemi, Project Reconnect, is helping this week in the internet cafe in Berlin Wilmersdorf. Project Reconnect supports the initiative "Protecting women and children in refugee shelters" set up by UNICEF and the Federal Ministry for Family, Senior Citizens, Women and Youth. 300 Chromebooks will be available to families in refugee accommodation throughout Germany for learning, playing and researching. The Stiftung Sozialpädagogisches Institut Berlin is responsible for the use of laptops both pedagogically and technically. At the World Refugee Day the first Chromebooks were distributed to the institutions. Sybille Fleischmann (left), Project Reconnect, at the transfer of the first Chromebook by Thoralf Schwanitz from Google.